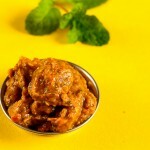 Mamidikaya Pulihora recipe Andhra style (మామిడికాయ పులిహొర). Very abundant in summer, the green raw mangoes are used to substitute lemon and tamarind in many gravies, dals and pulihora. Sour when raw, sweet when ripe mangoes are a tasty delight to relish. 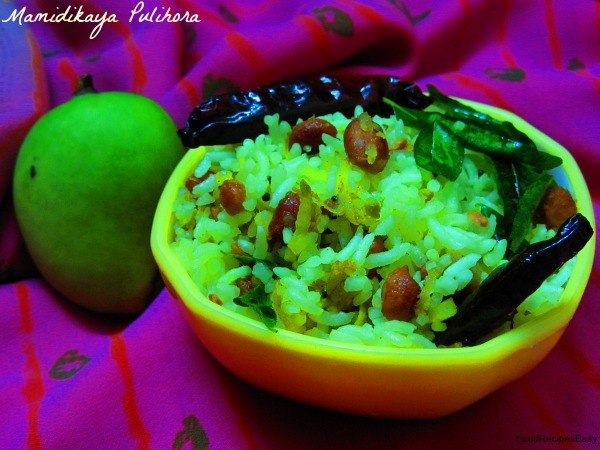 Mamidikaya pulihora / raw mango rice is a hot favourite in our house during summers. Tangy and hot with grated mango and hot chillies, the simple Andhra recipe mamidikaya pulihora is both healthy and tasty. 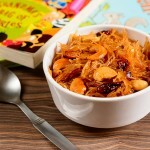 Raw mango rice / Mamidikaya pulihora serves as one pot meal and can be packed for lunch boxes. 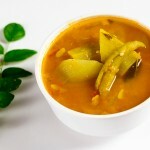 Mamidikaya pulihora is a hot favourite during summers. Wash the rice thoroughly. Add 1 ½ cups of water for 1 cup of rice and cook. Take the cooked rice in a wide bowl and let it cool. Heat oil in a pan for tempering. Add ground nuts and fry till brown. Then add urad dal, chana dal, red chillies and mustard seeds. Once they splutter, add green chillies, hing and curry leaves. Now add the grated mango and cook on a low flame till the mango turns soft. Quickly toss the contents and turn off the flame. Do not burn the grated mango. Add turmeric and mix well and turn off the flame. Now add this mixture to the cooked rice. Add salt and mix well with hands making sure not to crush the rice grains. Check the taste and add salt if required. 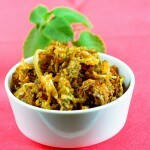 * You can also add chilli paste instead of chopped green chillies to make it much hotter. 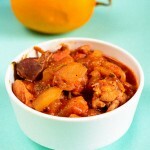 ** You can add the grated mango directly to the rice and mix it instead of cooking in the tempered ingredients. For this, let the rice cool and add the grated mango and mix well. Add the tempered ingredients later. *** You can also fry all ingredients one by one and add to the rice if you feel the ingredients will get burnt. 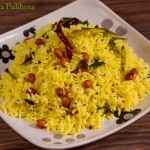 There are few more yummy and easy dinner ideas – Nimmakaya Pulihora recipe, Sweet Corn Pulao recipe and Tomato Peas Pulao recipe.